Works with any Windows-compatible sound card. Supports the most common audio formats: MP3, WAV, MP2, OGG, WMA, FLAC, AAC+. 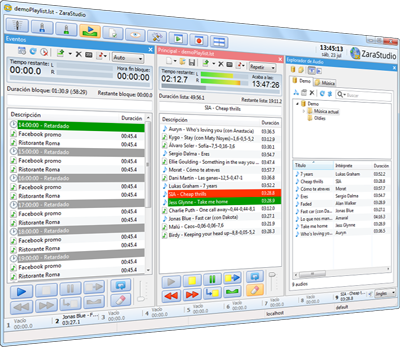 ZaraTraffic is an application to manage radio stations commercials. Generating automatically commercial blocks without worring about how to distribute the commercials, creating broadcast reports, making invoices or managing clients are extremely easy tasks with ZaraTraffic.